TALLAHASSEE — Mobile devices are not only all consuming in our daily lives, but it also seems that they are essential to all we do. As it turns out, there are more mobile devices on the planet than human beings, and those notebooks, cellular phones and laptops have to be charged. Finding that energy source in the traditional outlet is often tough and sometimes a mission that becomes frantic because so many people are doing the same thing! The Florida A&M University School of the Environment is offering students the experience of recharging and relaxing courtesy of the sun. Powersol, a solar paneled umbrella, also brings solar options into the conversation about sustainable energy resources. 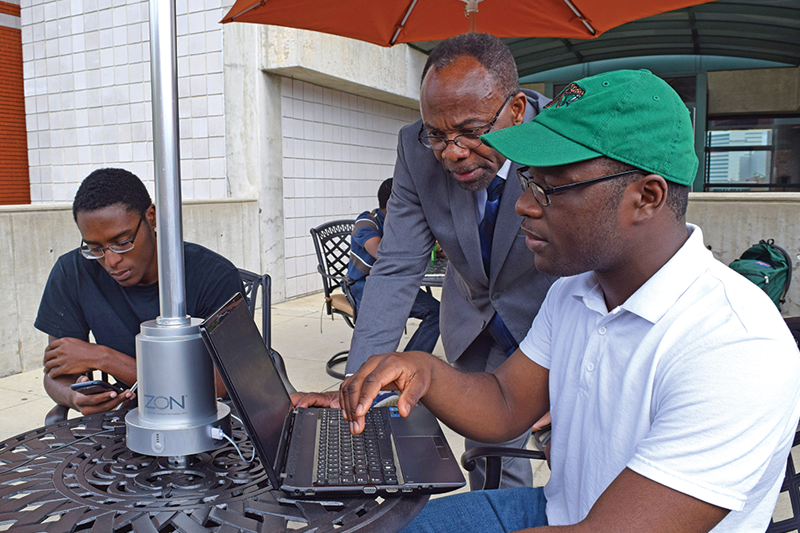 SOE Dean Victor Ibeanusi, Ph.D. said students are the instigators of new technology and are primed for taking solar energy into the future. “Students are the leaders in Mobile Users. The School of the Environment is committed to creating a student-centered environment to support the use of mobile applications in student learning through the Powersol Umbrella. 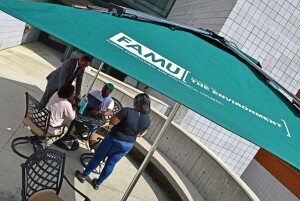 The solar umbrella also serves as part of the features of our outdoor green corridor, where our students can lounge and are provided with affordable and sustainable charging power anywhere,” he said. Three Powersol umbrella stations will be housed the south entrance walkway of the Frederick S Humphries Research Center home to the SOE. The umbrellas not only provide protection from UV rays, but the solar panels atop it also provide mobile device charging as fast as a wall outlet, day or night. Three weatherproofed ports charge up to three mobile devices simultaneously. Intelligent sensing acknowledges when the mobile device is fully charged, and LED display indicates how much solar energy is currently stored for charging needs. The Powersol is manufactured by ZON. Sarah Akin, who founded the company, rebooted the application of traditional solar power usage by combining it with a commercial-grade patio umbrella to provide shade, clean energy, and convenient mobile device charging. Going green has never been easier.